I meant to make this car seat cover as a Christmas present for my sister and her new baby girl. Alas morning sickness took over my entire life and crafting became a thing of the past. Today was a day that I never thought I would see again in my entire life... I did something crafty. As dramatic as this might sound to some of you out there, I truly felt that I would never feel like myself ever again. I know there are a few of you women who can sympathize with me. As I held my rotary cutter in one hand, and smoothed out the fabric with the other I sighed a sigh of pure joy that I had finally hit my 16 week mark in this pregnancy of mine, and that I had FINALLY caught my second wind. Thank the heavens above. And now enough of my babbling and lets make ourselves a car seat tent/cover. I couldn't believe how easy this was! I whipped it up during my son's 2 hour nap today, no pattern no nothing. I know there are probably a ton of ways of doing this.. but this is my way. Hope it helps! *You'll need a yard of fabric for the topside and a yard of fabric for the underside. *About 1/4 a yard of a solid color of fabric for the trim/ruffle that will be sewn all around the entire tent. Measure about 4-5 inches off the top and cut straight off. These cut off pieces will be perfect for the straps to hold the tent to your car seat. 2. Get you dinner plate. 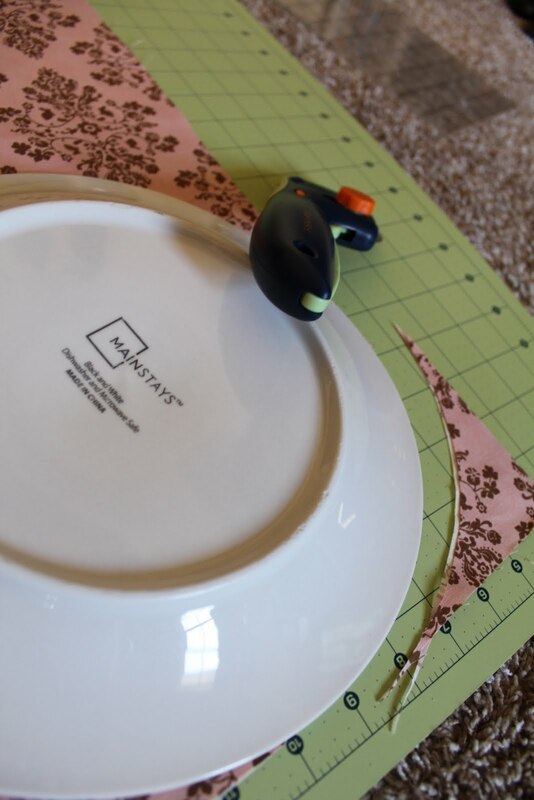 At each corner slide the dinner plate as far as you can and cut excess fabric to form a rounded edge. Do all four sides this way. 3. Put this fabric to the side and get out 1/4 yard of solid fabric. Cut this fabric into 2 inch strips. 4. Sew each strip together to form a really long strip. 5. Take the long 2 inch strip and fold it in half like a taco so the fabric becomes one inch thick. Iron the fabric so that it stays put. Now you should have a very long 1 inch thick piece of fabric. One edge should have the two raw edges touching. 6. Gather the solid fabric to create pleats or ruffles. Pin this in between the large top and bottom pieces. Be sure that your top and bottom pieces are still right sides together. All raw edges should meet up. The folded edge of the solid strip should be facing in between the fabric, kinda like a sandwich. (Does this make sense?? 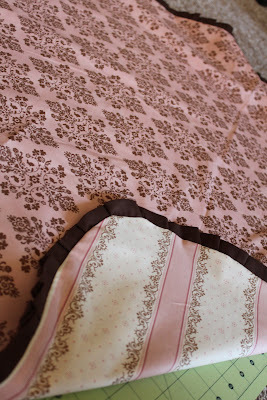 Click here, Check out my flirty apron tutorial. 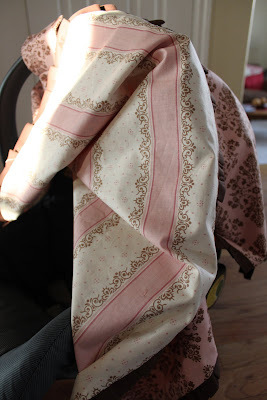 I did the ruffle the same way here as I did for this car seat tent. If that doesn't help email me!!!!) 7. Sew all along the entire perimeter of the car seat tent leaving a small opening to pull the fabric through so that the right sides will show. 8. Iron flat! Tack down the small opening that you fed the tent through as well. 9. Now for the straps. Simply use the left over strips from earlier. I trimmed them down a bit. Sew them together, and press with an iron. 10. Each car seat's handle is slightly different. I assembled the tent and straps with pins on the actually car seat to get it just right. Glue or sew Velcro on the edges of the straps. Velcro your new car seat tent/cover on your car seat! Your done!! Now you can take your cute little baby all over town in style and safe from all the elements! Oh, and if you want you can embellish the straps however you like. I decided to keep it simple... I mean this was my first crafty project in about 4 months. I gotta ease into this stuff. :) Now for a nap.. I should have paid you to make one. I bought one (on sale HA!) for like $40ish bucks... ouch. I would have sewn one but watching me sew is entertainment. Probably should make a movie. Yours looks fabulous!! Love it. I've been planning on making one, now I'm just that more motivated, and you made it look easy enough! Thanks! I am so glad you posted this on facebook. I really wanted to make one of these for my baby. 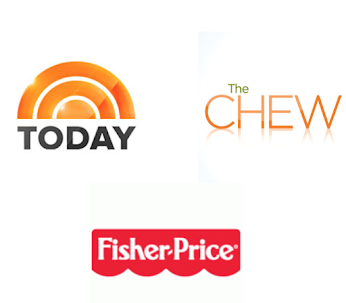 I don't remember anything like this just a few years ago. With your tutorial I think I might actually be able to pull it off. It won't be as cute as yours but it will function properly. Thank you so much!!!!!!!!!! yay!! Have fun making them! Just finished one for my fourth granddaughter due in January! It turned out beautiful. Added some embroidery to the one side. 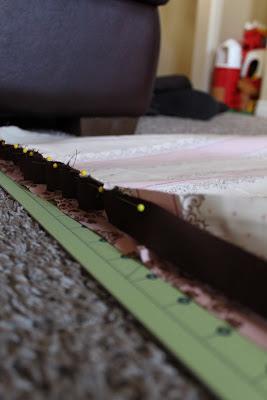 Just a note, I learned the hard way: If your pattern goes vertically you will want 1 and a 1/4 yards so you have enough to get the 42" the other direction. Thanks for the instructions! I Love the directions - I have been looking at them - And didn't want to spend the $ - No I can do it myself... Any suggestion on how to add a slit down the middle for an opening? What Amanda said above..plus what did Melonie mean about vertically? Thanks..
What Amanda Berry said and what did melonie mean about more Fabric? Where? Cut how? Thanks!